I would never imagine that there are different species of lizards in Florida and they are easy to find and truly interesting to watch. Among them are Mediterranean Gecko, Indo-Pacific Gecko, Florida Worm Lizard which looks like a large pink earthworm,green and brown Anole,fence Lizard, Florida Scrub Lizard, Rainbow lizard, Eastern Glass Lizard, Brown Basilisk, Giant Amevia and more. More than once, I saw something crawling so fast on the dirt. I was startled for I was so sure, I saw a snake but, I was confused for it has 4 legs. While doing my research about lizard, I finally knew that what I saw was called skink, a type of lizard. There are so many types of skink too like the following: Ground Skink, Mole Skink, Sand Skink, Broad-headed Skink and more. It actually looks like the photo above. 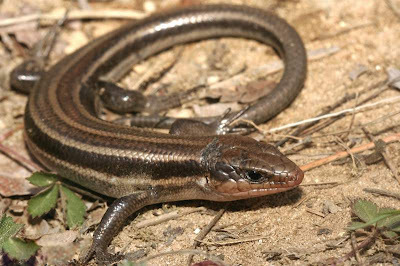 Now, the five-lined skinks are diurnal which means, they are active during the day. They like to soak up heat from the sun during the day. No wonder why I saw them under the dirt. You should remember, our soil here is so sandy. They eat mostly insects such as crickets, grasshoppers, beetles, caterpillars, spiders, earthworms, snails, slugs, and isopods. They love to climb dead trees where there are a lot of insects. Their predators include Raccoons, snakes, and hawks. For this lizard that I have here, they love to hang out on the backyard. They are big too and usually, they stay on the fence most of the time. Next time, I will take photos of the different lizards on my backyard. I just find it interesting to know what kind of lizards they are. Thanks for stopping by today. I will see you next time. Anonymous: No they don't change color.